RPF Recruitment 2019:- Railway Protection Force RPF Vacancy 2019, Download RPF Railway Notification 2019 Official Announcement, Apply Online for RPF Application Form 2019. Indian Railway Ministry is giving back to back the opportunity to the candidates. Now more than 9,500 Railway Protection Force (RPF) posts have been released. Read the complete notification of the Railway RPF 2019. Check that this Railway RPF Post suits you. The Railway Recruitment Board (RRB) is on full acceleration to accomplish candidates wanting to get a job on Indian Railway. 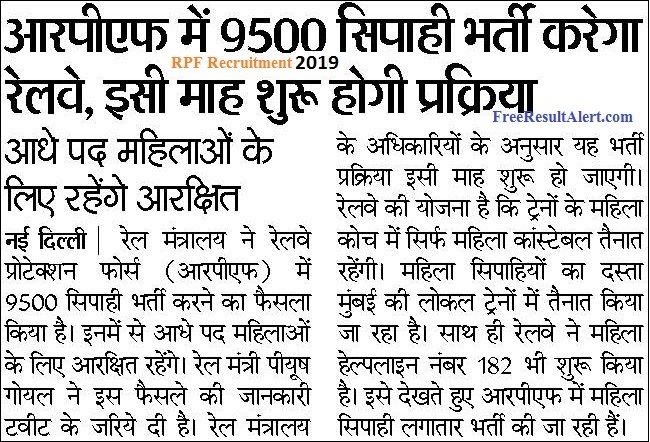 Railway Protection Force (RPF) 2019 Vacancy Online Date notice says female candidates will occupy 50 percent of positions from 9,500 posts. RPF Constable Recruitment 2019 is going to start in March/April 2019. For all 12th pass candidates, Railway Constable (Sipahi) post is released. It’s a great time for Indian Railway Jobs and students to apply for the upcoming Railway Vacancy 2019 RPF. Students who meet RPF Constable Eligibility standards may apply for RPF Application Form 2019 Apply Online for RPF Recruitment 2019. Other posts of SI will also release under Railway Protection Force Bharti. The willingness of students for railway jobs is clearly seen in the previous two months. Where 1.5 crore candidates have applied for railway group-d posts in till then First Week of March 2019. Railway ministry will release the RPF Online Form 2019 Apply Online Link, Along with the Start & Last Date for the Notification of RPF 2019. ➥ Age limit:- Minimum age for RPF Recruitment Notificaiton should be 18 and Maximum should be 25 Years. ➥ Educational Qualification:- For RPF Constable post 12th pass certificate is must. ➥ General Category:- 40/- Rs. Candidates will select on the basis of or written examination and physical test in this recruitment. To get the RPF Constable 2019 Recruitment Vacancy Notification, all tests must be completed. Students can scroll through the official RRB website for the update or be patient as we will update our website soon after the release of the Railway Protection Force or RPF Notification 2019. Download RPF Recruitment notification from the links given below. Note :- यदि आपको रेलवे प्रोटेक्शन फ़ोर्स (RPF) से संबंधित किसी भी प्रकार की समस्या हो तो आप नीचे दिए गए कमेंट बॉक्स के माध्यम से पूछ सकते हो हमारी टीम आपकी पूरी सहायता करेगी! Open the Official Website of www.indianrailways.gov.in. At the Top, Click on the Recruitment section. Then, Select Your Region & Again Click on Your Region Name. There, You can see the Direct Download of RPF Railway Notification 2019 Direct Link. Click on the PDF Download Button. Finally !! Your Railway Protection RPF Recruitment 2019 will Appear on the Post.